It's almost here! School is set to start soon, which means it's time to set a consistent bedtime routine and think about homework. Are they ready? I know my girls have enjoyed the relaxed summer schedule, and they're feeling a little sad about restarting the school routine. That's why I've come up with six fun ways to beat the back-to-school blues. 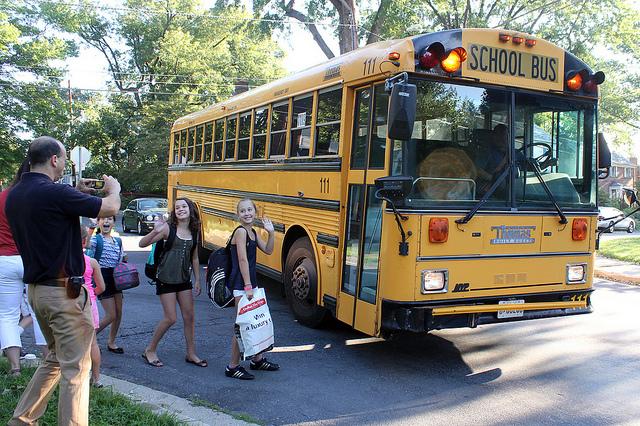 Maybe some of these tips will help your kids feel better about starting school, too! Every summer, I schedule a back-to-school play date with my girls' favorite friends and any new kids who moved into the neighborhood. We meet at a local park where the kids talk about their summers, eat healthy school-themed snacks, and plan for the new school year. This fun day gives them a chance to rekindle old friendships and make new friends before the busy school year starts. My girls each have their own idea of the ideal summer, so we create a summer bucket list. This year, they wanted to visit the zoo and our favorite ice cream shop. When summer comes to a close, we check our bucket list and each choose one last thing to do. It's always fun to end the summer with a bang, and the bucket list helps my girls feel like they enjoyed summer to the fullest. What do you want to wear on the first day? Who do you hope to sit beside in class? Who do you hope you don't have any classes with? Which teacher do you want/not want? What are your thoughts about homework? Do you want to join any activities or clubs? What's the one thing you're most excited about? What breakfast and dinner do you want me to make you on the first day of school? Because bullying, hard classes, or a disinterest in school do affect kids, I found that creating an action plan before school starts helps. For instance, one of my daughters struggled in math last year and cried every time she did homework. This year, I emailed the teacher before school started and asked about available support. My daughter knows that she'll have a study buddy this year, and that automatically helps her feel less stressed and nervous about the first day. If your child struggles with something, take action before school starts. New classrooms, teachers, and buildings can be intimidating to some kids. That's why I like scheduling a "meet the teacher" day. We also take a test walk to school and look for playful landmarks like colorful murals, unique buildings, or fun playgrounds. When we can't visit the school before the first day, I at least review the schedule with my girls. We set up a mock classroom, and the girls take turns being the teacher. Doing all of this prep work helps them know what to expect and reduces first-day jitters. Plus, it's a fun way to play school without doing any homework! It sounds strange, but shopping helps to build excitement for the new school year. Last year, my girls couldn't wait to show off their new outfits and backpacks. Even though they don't need much this year, I'll at least let them buy a few supplies and new shoes as we prepare for a successful year. 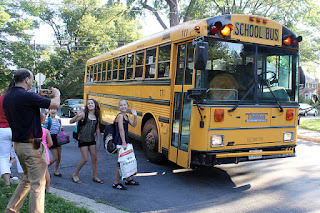 Are your kids ready for school to start? They can be when you do one or more of these six back-to-school activities. Feel free to put your own spin on it and modify it to meet your kids' needs. Which one will you do today?